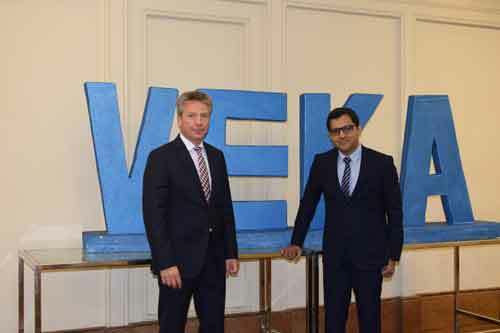 VEKA, the world’s biggest uPVC window profile extruder, is expanding its presence in India. The company has recently commissioned a new 150,000 sq ft, uPVC extrusion facility in Hyderabad with fully automated mixing and conveying system. The company, a 50:50 JV, announced fresh investment to the tune of `250-mn in machinery, product enhancements, new showrooms, and marketing outlay. This investment is in addition to `500-mn into machinery and building of the factory in Hyderabad already invested by the Company. “India is a key focus area for us, the growth potential for uPVC windows in this region is expected to far out-perform any region in the globe. We are making the required investments in this region to capitalise on this opportunity,” says Andreas Hartleif, CEO of VEKA AG. The company has firmed plans to launch four new showrooms going ahead. The fresh investment by NCL VEKA comes at a time when demand is increasing. uPVC has been a late entrant in the Indian market and currently holds 15 per cent share of the windows market. Even in a sluggish real estate market, demand for uPVC has witnessed consistent growth of around 25 per cent over the last decade, with uPVC becoming the preferred choice for windows amongst customers due to better aesthetics, longer life, less maintenance, better insulation and factory finished windows. NCL VEKA has been aggressively growing with 30 per cent growth YoY. It clocked a turnover of `163-cr (FY 2017-18) and has built strong partnerships with 250 specialist fabricators to serve markets across India. The new NCL VEKA factory, with capacity for 30 extruders, makes the company the largest player in India. “While, 18 Extruders are already ordered and commissioned, 12 more are expected to be in place over the next year. When the plant is fully operational, we will have the capacity to produce over 30,000 tons of profiles, and manufacture over 1.7 million windows annually,” Ashven added. VEKA is a $1.2-bn company and one of the largest producer of uPVC profiles in the world with operations in manufacturing units in 18 countries, operations in 40 countries and total employees of 5,500. NCL is an `1,500-cr building materials manufacturer based out of Hyderabad with products ranging from Cement, Boards, Windows, Doors, Paints and Plasters and AAC Blocks.